Mt. San Gorgonio (also known as old Greyback) has claimed the lives of Frank Sinatra’s mother and Dean Martin’s son, in unrelated plane crashes. Crazy – but it’s true! On December 1, 1953, a Douglas C-47 Dakota, crashed at 11,000 feet (3,400 m) on the eastern face of the mountain. The C-47 was en route from Offutt Air Force Base, Nebraska to March Air Force Base near Riverside, California when it struck the mountain at night in the middle of a storm. Thirteen people died. Then, nearly one month later, a C-47 accident a Marine Corps helicopter crashed on the mountain in coordination of the efforts of recovering the victims. The three crewmen of the helicopter survived the impact. Most of the wreckage of the two aircraft remain on the mountain and are accessible via the Fish Creek Trailhead or the South Fork Trailhead. The summit of Mount San Gorgonio is perched at 11,499ft above sea level in the San Bernardino Mountain range. There are many trails to choose from, however the one we chose was the Vivian Creek trail. The Fish Creek trail is probably the least used and is aprox. 9.1 miles one-way. The South Fork Trail is over 10 miles one-way. The shortest way to the summit, and the most popular, is the Vivian Creek Trail. It’s 7.8 miles (Gary Suttle’s book lists it as 8.4 miles) with almost 5,500 feet in elevation gain. Summertime tends to be the most crowded but it is a great mountain to climb anytime of year. I’ve climbed it many times during winter and have found myself to be the only soul on the mountain. Hard to believe being so close to the Los Angeles/Southern California area. The TOPOZONE MAP states an elevation of 11,499 feet shown at the trail’s end at the higher summit. If you want a permit for Vivian for a day hike on the weekend in the summertime, you must get it 3-4 weeks in advance. South Fork camps such as Dry and Dollar Lakes are also filling several weeks in advance for summer camping. As you might expect, if you want to hike during the week, you have a better chance of getting a permit. Self-issue permits aren’t always available – they oftentimes run out, or get stolen. So we recommend getting your permit in advance! Note that it takes at least 72 hours for processing of permits. And as a reminder, self-issue permits are only good for that day. In addition to the wilderness permits an Adventure Pass is required for each vehicle; fees are $5.00 a day or $30.00 for an annual pass. These can be obtained from any of the ranger stations or from many of the local merchants. When To Climb? Year round. Summer months are the most popular for hikers. Great snowshoeing in the Winter. Camping is allowed. There are several campgrounds in and around the area and at several of the trailheads. Camping on the mountain or anywhere within the San Gorgonio Wilderness requires a permit that can be obtained from the San Gorgonio Ranger District at 34701 Mill Creek Road in Mentone, CA. Phone is 909-382-2882 or you can request a permit via fax at (909) 794-1125. Mountain Conditions contact San Bernardino National Forest, San Gorgonio Ranger District, 34701 Mill Creek Rd., Mentone, CA 92359 909-382-2882 or fax (909) 794-1125. The Vivian Creek Trail is the shortest and the steepest route to the summit of Mt. San Gorgonio. One and two-tenths miles from the trailhead is Vivian Creek Camp (7,100′). Campsites are located upslope to the right of the trail after reaching the stream: one is halfway up the slope, and the other is at the top of the slope (no camping within 200 feet of the trail or creek). One and three-tenths miles from Vivian Creek Camp is Halfway Camp (8,100′). Water is obtained from the creek 200 yards before camp. Two and three-tenths miles further is High Creek Camp (water available – 9,200′). The summit of San Gorgonio (11,499′) is 3 miles beyond High Creek. The upper end of this trail offers outstanding views of Yucaipa Ridge and Galena Peak, as well as sweeping panoramic views from the top of Mt. San Gorgonio. After the South Fork Trail, this is the second most used trail in the Wilderness. The Vivian Creek Trailhead is reached by turning east off Highway 38 to Forest Falls. Continue through Forest Falls to the top end (east end) of the picnic area at the end of the road (6,080′). We set off on Saturday November 26th, from the Vivian Creek trailhead car park, at 6:30am. 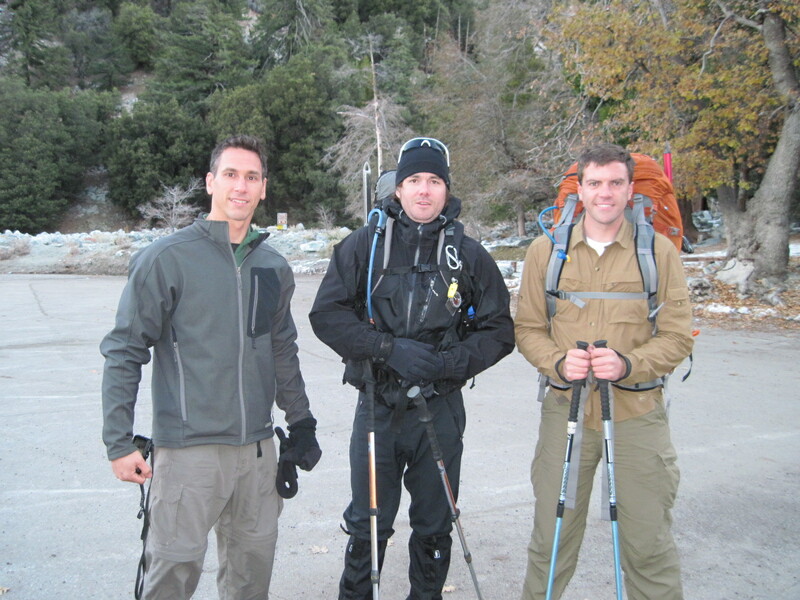 San Gorgonio Trail conditions, November 2011. Patchy snow above 6,000 feet, snow shoes from 9,000 feet depending on the face. Crampons will soon be used as the trail is being compacted and turning into thick, slick ice. You start by walking to the end of car park, the trail sign directs you across the wash, where you will then turn left and start-up the switchbacks for about an hour. This section is very steep and strenuous, so maybe take caution not to burn yourself out early. Also, hiking poles may help here. The Switchbacks on Vivian Creek trail, San Gorgonio mountain. After the wash at the beginning. I am using a pair of REI light poles. Very good, easy to use, shock absorbing and strong! You will cross the creek twice, first using a huge fallen log as a bridge, then across rocks in the stream, after which you will approach Half way camp, (not halfway to the summit). Vivian creek goes left at that fork toward High Creek camp. Trail Breaking between Half way camp and High Creek camp. Amazing views to take in of surrounding ranges. You will then arrive at High Creek Camp. There is a sign, 200 yards to camp, follow it up, and the camp is just prior to crossing the creek. We set up our tents pretty close together, on the site, already leveled by park services. Our base camp at 9,200ft, at High Creek camp on Vivian Creek trail, San Gorgonio. Hydration is key at this elevation. Air is dry, and your body is working hard coming from sea level. It may be a good idea to hydrate until you are unable to drink anymore. We took 2 litres each and were out of water by the time we reached this camp. We set up camp at 11am and left at 12:30pm for the summit. From here we needed snow shoes, and trail broke the switchbacks all the way up to the above ridgeline. We snow-shoed all the way to the top of the ridge, then traversed to the left. You can see the backside of San Gorgonio from here, even the other trails leading up to it. You can see Palm Desert and San Jacinto from here. Be careful, have enough water, it will be 5 hours in the snow before we got to the creek again for water. We brought light packs, and 2 litres of fluid each. Just enough water. You will also merge with the Dollar Lake trail (be cautious not to miss this turning point on your journey down), continue right and traverse below the ridge, being careful to keep left once on the trail. You will travel through 2 little summits, to the real summit, which is a bunch of rocks, providing a little shelter from the winds if they are kicking up. You will then arrive on the summit, be sure to have extra clothing, if the winds are up, the temperature can plummet. Covering your ears here would be recommended. We descended in the dark with headlamps as the days are short in November. We also cut straight down through the switchbacks descending straight down to camp from the ridgeline to save time. But a recommendation may be to only cut when you can see the trail below with your headlamp as the fallen trees can look like the trail below at night. It saved us about 45mins on the descent. We had food and re-hydrated, then slept. The next morning we got up at 6am, had food, tea and packed out. By 9:30am we began the climb back to the car park, which is easy to follow from High creek camp. It took us 2hrs 20mins at a fast pace with 52lb packs on. It is a highly recommended hike, great challenge and impressive elevation gain.